A major new talent debuts — enter the unique world of Doggerland. 30,000 copies sold in six months. It’s the morning after Oistra, the big oyster festival on Heimö the main island of Doggerland. Detective Inspector Karen Eiken Hornby wakes up in a hotel room with a monumental hangover, only matched in size by the regrets she has about the night before. The same morning, a woman is found brutally murdered on another part of the island. News of the murder hits the small, close-knit community hard. Karen is put in charge of the case, complicated by the fact that Karen’s boss used to be married to the victim. He is also the very same man Karen woke up next to in the hotel room that morning, making Karen his alibi. Something she is not keen to share. Karen starts unravelling leads in the case, threatening to unearth secrets long buried. Perhaps the story began with the islands’ secretive commune in the 1970s. Perhaps it has its roots in a phone call in the spring this year. Try as she might, Karen can find no motive for the killing and she has to dig deep into the islands’ history to find the answers. The layers of deception run deep. 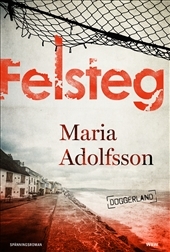 DOGGERLAND: Deception is the first book in a series, with Detective Inspector Karen Eiken Hornby in the lead.